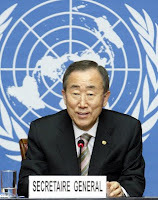 According to UN Secretary-General Ban Ki-moon (right), while the responsibility to protect concept came of age in 2011, the challenge facing the international community remains that of transforming the concept from ‘promise to practice’ or from ‘words into deeds’. In my view, the significance of the concept lies in its capacity to do the reverse – that is, to transform practice into promise, or deeds into words. ► ONUC, the UN Operation in the Congo in 1960. The techniques of executive rule developed under Hammarskjöld’s auspices during those early crises of decolonisation – fact-finding, peacekeeping, strategic forms of technical assistance, and civilian administration – have, of course, since expanded dramatically. Yet as Hammarskjöld recognised, little in the UN Charter suggests its authors envisaged the creation of an international executive that could undertake such wide-ranging forms of action. 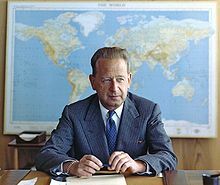 Hammarskjöld (prior IntLawGrrls posts) interpreted these provisions as giving the Secretary-General a position of full political independence and a broad discretionary mandate to engage in fact-finding, preventive diplomacy, and other behind-the-scenes activity necessary to carry out his functions. He thus did not interpret the limited attention in the Charter as a constraint on executive action. Rather, he considered that ‘the executive functions and their form have been left largely to practice’. He argued forcefully that it was necessary to stop thinking of the UN merely as a forum for ‘static conference diplomacy’ and instead reimagine it as a ‘dynamic instrument’ for ‘executive action, undertaken on behalf of all members’. And he emphasised the ‘margin of confidence’ that ‘must be left to those who will carry the responsibility for putting the decisions’ of the political organs ‘into effect’. Similarly Oscar Schachter, in an American Journal of International Law article written in 1962, soon after Hammarskjöld’s death, suggested that the expansion of ‘executive action’ was ‘widely regarded as constituting a major feature’ of Hammarskjöld’s legacy. Schachter argued that such “‘operational” measures’ were clearly related to international law’, because they created ‘new conceptions of permissible and impermissible interference’ as well as new conceptions ‘of the Charter obligations for mutual assistance and co-operation’.